Take a walk in Albany, Wisconsin, the sweetest little village on the Sugar River, and I can bet you will be greeted with a friendly smile, kind wave, or even a hearty ‘Good Morning’. One friendly face you may meet would be that of active community volunteer, Gloria Glass. You may see her helping out at the food pantry, assisting at the Albany Historical Society, collecting donations at the Albany Thrift Store, or even delivering meals to homebound seniors in the community. Gloria, age 81, has been delivering meals for more than 20 years! The Green County Senior Nutrition Program operated by the Aging & Disability Resource Center would like to extend a sincere thank you to Gloria Glass, and to every volunteer who dedicates countless hours to making sure those in the community who need a hot, healthy lunch receive it. New Glarus is a town for fun. Known as ‘America’s Little Switzerland’ and home to the Swiss Historical Village, the New Glarus Brewery, and the Wilhelm Tell Drama Festival, there are plenty of opportunities to enjoy yourself. New Glarus also offers fun in places you never would have imagined, but you don’t have to take my word for it. Just ask Suzi Janowiak, retiring home delivered meal driver for the Green County Nutrition program. “You’ll be surprised how much fun it really is, I definitely was!” says Suzi. The Janowiaks moved to New Glarus in 1995. Quickly they learned that New Glarus offered many opportunities to be involved. In 2000, Suzi read a letter to the editor in the local paper requesting volunteers to deliver meals right in her own community. The author wanted everyone to know that “the need is real” and Suzi remembers those words to this day. Thirteen years and an uncountable number of smiles later, Suzi fully understands how real the need is. The Home Delivered Meal Program not only provides a hot noon meal, but also a friendly face and safety check-up to those who are homebound in our communities. “I have made so many friends! I remember them all,” says Suzi, “I’m surprised how good it made me feel!” We are very thankful for the time, effort, and enthusiasm Suzi has brought to our program, the difference she has made is immeasurable. We wish her the best of luck with the new grandchild and her future endeavors. For anyone out there wondering if you have time to have as much fun as Suzi, she has a few words of advice. “It will take less time than you think, and it flies because it’s really really fun!” Thank you again Suzi for your commitment to serving those who need us most in our communities. The need is definitely real. 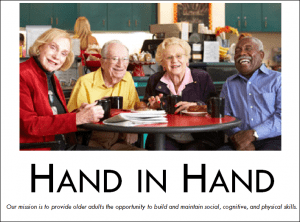 For more information about this program please contact the Aging & Disability Resource Center at 608-328-9499. It all started with a challenge. It was a call to action to those in the community to reach out and help their neighbors. It was an opportunity to make sure those who needed a hot meal got it. And it was a chance for Woodford State Bank employees to shine. 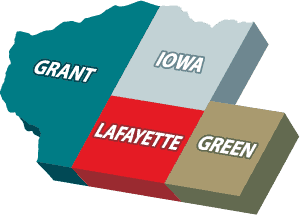 In May 2005, Woodford State Bank accepted a challenge posed by the Green County Leaders to support the Home Delivered Meal Program by delivering meals once a week. Woodford State Bank supports other programs in the community and saw this as another avenue to make a difference. Woodford State Bank volunteer, Val Johnson, commented that the biggest surprise for her when she first started was “the number of people that do rely on this program.” Marci Ziltener, another volunteer, was also surprised at “how the number of people has increased, the route has doubled since I started.” Since the beginning, there have been over 10 employees who have been trained to join their team. Employees go in pairs and take turns covering one route every Thursday. “We volunteer to go and we block off a window of time to ensure we have staffing coverage to make it work,” comments Johnson. “Woodford State Bank encourages us to volunteer and also covers our time,” says Laci, “once we are done we can take our normal lunch break if we want.” With a team of volunteers, the work is shared and Woodford State Bank can serve their customers and help homebound seniors in the community all in a day’s work. The Home Delivered Meal Program continues to grow in Monroe and all of Green County every year. On average 50 meals are served daily in Monroe. Volunteers play the biggest role. Last year over 5,500 hours were given to make sure these meals were delivered hot and ready to eat. As the population of Green County ages and costs continue to rise, the need for support for individuals to remain independent and at home grows as well. Providing a nutritional meal that meets at least one-third of the nutritional value a person needs everyday helps them stay strong. But the Home Delivered Meal Program also provides a safety check. If someone is not home, the volunteer reports back and the Dining Center Manager makes sure the person is safe. Volunteers can add a smile to someone’s day and maybe even a few minutes of conversation. “It’s always a pleasure to visit with the people and know that I’m making a difference in their lives,” says Ziltener. “I enjoy this!” says Kim Fiez. Thanks to generous neighbors like the employees at Woodford State Bank, the Green County Senior Nutrition Program is able to continue to serve homebound individuals. We are truly grateful for the time and talent our volunteers share to make this program possible. It is said that for a community to be whole and healthy, it must be based on people’s love and concern for each other. That means giving a friend a ride to the doctor, lending a helping hand with yard work, or making sure homebound neighbors in our community get the nutrition they need, all make our local communities stronger. Being a good neighbor comes in all shapes and sizes, but for Colony Brands it is a priority to make sure seniors and those with disabilities in Monroe have a hot, nutritious meal available to them each week. Colony Brands, Inc. employees in Monroe began working with the Green County Nutrition Program as Home Delivered Meal drivers in 2008 when asked to cover a route each Friday through a program with the Green County Leaders. “We feel very strongly as a company about our responsibility to the community, and our employees feel the same,” says Shelia Berrey, Public Relations Manager, “so when we were contacted to see if we were interested in a route our employees were very enthusiastic to get involved.” Since the beginning of Colony Brand’s work with the Home Delivered Meal Program there have been over 25 employees trained to join their team. Employees then take turns covering one route on Friday. “I never have trouble getting employees to say yes to their turn,” says Berrey, “the company covers the time they are volunteering, but most are so busy that they choose not to take an additional lunch hour.” The Home Delivered Meal Program continues to grow in Monroe and all of Green County every year. With 70 meals delivered in Monroe daily this spring, volunteers are the integral part that keeps the program going and allows people to safely stay in their homes. From her experience, Berrey comments that, “I was surprised about the great need that’s out there, and how very much the recipients rely on this program.” Families and friends of homebound individuals know and depend on the Home Delivered Meal program to provide not only a nutritious meal, but also a daily safety check with their loved one, and it shows when the volunteers come to the door. There are many smiles and cheerful greetings. For generations households across Green County have brought together families, friends, and neighbors for one main purpose – a good hot meal. It was a time to catch up, share joys or woes, and stay healthy. There was no better way to spend your day. In today’s society, everything moves faster, including food, but there is one opportunity right here in your community that is grounded in tradition and that is the Home Delivered Meal Program. Wisconsin Disability Vote Coalition Wants to Hear from You!! New Medicare Cards are Being Received – Watch out for Phone Scams!